100ml/90g oil of choice (sunflower or coconut oil) or 110g /5½ tbsp unsalted butter, melted. Preheat oven to 170°C / 160°C fan forced. Grease brownie pan with oil or butter, and line the base with baking paper. Add contents of brownie mix sachet to a mixing bowl and combine with the protein powder. Whisk until combined. Add egg, water and oil to the dry ingredients in mixing bowl and mix with hand whisk or spatula until the brownie batter is smooth and glossy. Note: using whey protein is not recommended as it may adversely affect brownie texture. Pour batter into prepared tin, decorate with walnuts / nuts of choice and bake for 30 minutes. Serve room temperature, or store refrigerated in an airtight container for up to 7 days. 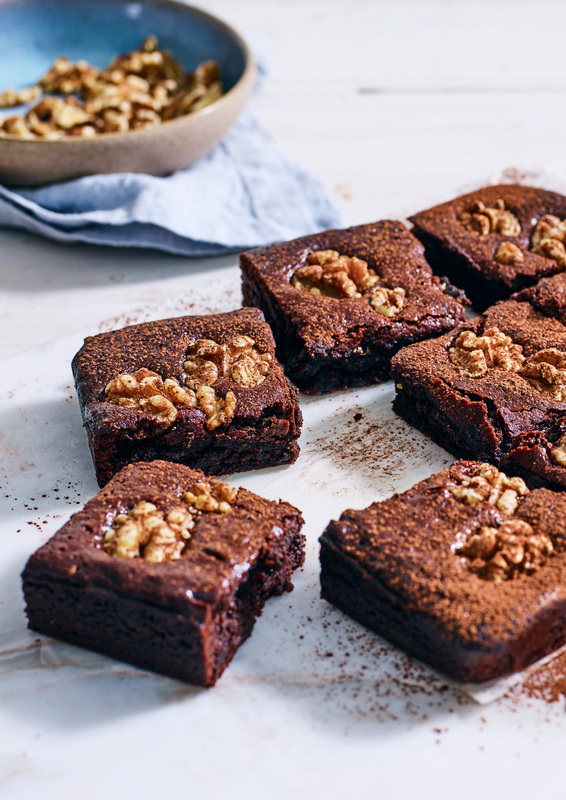 Nutritional information per serve (1 brownie, when prepared with sunflower oil and Happy Way Pea Protein powder: 104 calories, 5.4g protein, 4.8g carbs, 6.1g fat. Click here for a vegan-adaptable recipe for the brownies.